At least that’s the conclusion that some experts are coming to as investigations continue into what caused two plane crashes in Indonesia and Ethiopia in the past five months. Both flights were the new Boeing 737 Max-8 model planes and both aircraft lacked safety features that are sold as “extras” by Boeing, like a special light that notifies pilots when software on the plane may be getting a false reading. 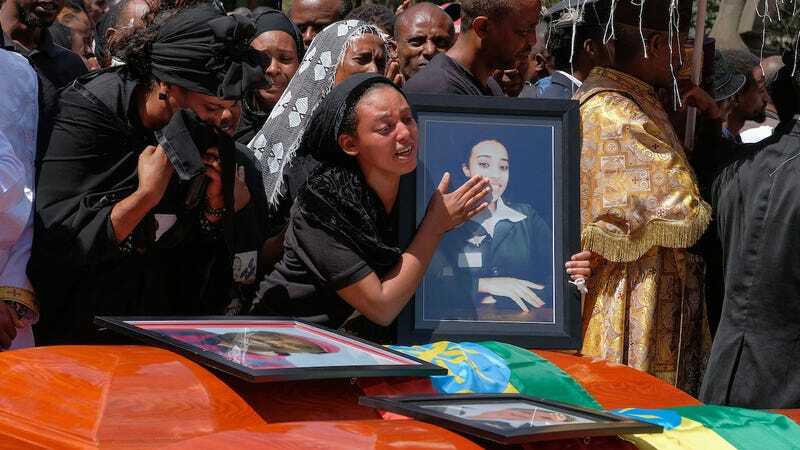 Ethiopian Airlines flight 302 crashed and killed 157 people shortly after takeoff on March 10, while Lion Air flight 610 crashed off the coast of Indonesia on October 29, 2018, and killed all 189 on board. The assumed similarity of the crashes, based on ongoing analysis by investigators, caused countries to ground the 737 Max all around the world. Boeing has promised that it’s working on the problem, which investigators believe may be the result of malfunctioning software and a failure to properly train pilots on the plane’s systems. Software on the Boeing 737 Max measures the angle of the plane and automatically tries to correct the aircraft when it believes that the nose is pointed too high, which might cause the plane to stall. The system, called the Maneuvering Characteristics Augmentation System (MCAS), may have gotten a false reading in both crashes, but without the optional “disagree” light to indicate that different sensors may be picking up different readings, the pilots might not have known what was going on. In a statement to Gizmodo earlier this month, Boeing acknowledged that it had made “updates” to the MCAS in its new planes, but that it was “designed to make an already safe aircraft even safer.” Gizmodo reached out to Boeing for further comment but did not immediately get a response. We’ll update this article when we hear back. The exact price of the safety features is unknown, but what is known is that Boeing makes a pretty penny from these “add ons,” potentially accounting for around 5 percent of the final price of the aircraft, based on data extrapolated from a 2013 report by consulting firm Jackson Square Aviation. What’s also known is that lower-cost airlines like Ethiopian and Indonesia’s Lion Air may be less likely to purchase the add ons. U.S.-based carriers like Southwest and American purchased the particular safety upgrades at issue for their 737 Max planes, according to the Times. United Airlines did not.